In the early 80's I met a girl who lived in Burton on Trent, who at that time was a Lorry driver. Her Mother was born in Germany and had married an English soldier. Together they had 3 children, Ilona, Anna Maria and Stephen. Around this time, the Mother was contacted by a chap in Bremen who, it turned out was her Son from her previous marriage in Germany. Ingo wanted to meet his natural mother, having only recently found out about his early life. Obviously an awful lot of water had passed under many bridges, but she was quite keen to see him after 35 years! He sent over a plane ticket for her to visit him, but unfortunately in the meantime, she suffered a heart attack and was not well enough to go. Ingo then made the decision to come to England instead. Fate then dealt a very cruel blow, when Ilona and I were visiting my Mother over in Hull for her birthday and Ingo's (and the other 3 childrens') mother sadly died. When we arrived back to Southport, messages had been left to try to break the news. It was never to be that he should see his mother again. It was left to me to break the news to Ilona of her Mother's death - something I will never forget. I accompanied Ilona to the funeral and the family get-together afterwards. The whole family were obviously devastated, but Ilona took it particularly badly. 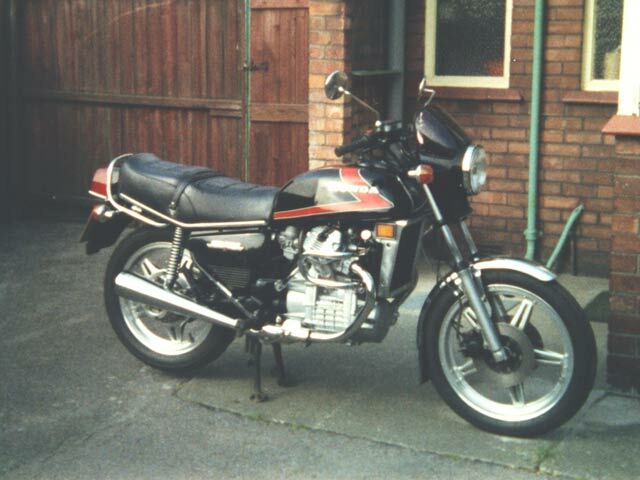 Some weeks later, I had some leave due from work, and I invited Ilona to come with me for a short break on the motorbike (a 1981 CX500A) to Holland to visit friends. I left it to the last minute before departure to tell her that I wanted to take her to Bremen, to visit Ingo and his partner, Jutta. Ilona agreed, and all the arrangements were put in place. We set off from Southport and headed off towards Norwich for a meal with friends, and then continued our journey to Harwich for the overnight boat to the Hook of Holland. It was April of 1982 and the weather was rather cold, but we easily made our way to Leeuwarden in Friesland to visit our friend Josee. We stayed there 2 nights and then made our way to Groningen to see another motorcycle acquaintance, Edo. When we got up in the morning I remember feeling rather ill, and had to visit to loo several times before we left, to head for Bremen. The weather turned really horrible as we approached the German border, and it started snowing very heavily, visibility being very poor as the icy wind tore into us. I remember stopping to try to clear my visor of snow in a little Rastplatz, by some lorries, hoping for a little protection. The weather improved a little, but I said to Ilona that I felt really rough, and as we pulled into the little village of Westerstede, I had to stop, as I felt that I could go no further. Ilona got off the bike and asked people in the street if there was a Doctor nearby. I just sat on the bike, on its side stand and curled up in a foetal position, awaiting death. I have never felt so bad in all of my life! It really seemed as if fate had taken a hand again to prevent Ingo from seeing his half-sister for the first time. Ilona eventually returned in a car with the Doctors receptionist, who then took me on to the surgery. We were treated very well by the staff in the Doctors, and given all sorts of lotions and potions to put me back on the road to recovery. Eventually, the receptionist took me on to a small Hotel for B and B, and spent some time explaining to the Lady owner, what I had to have and at what time during the night. Ilona had ridden bikes before, but nothing over 200cc and certainly nothing as heavy as a fully laden CX, but somehow she managed to get the bike to the Hotel and even parked it up safely for the night. I felt much better the following morning, which was Good Friday, and we managed to make our way to Bremen. We were to meet Ingo by the entrance to the Hauptbahnhof (main railway station) and although we arrived on time, He was nowhere to be seen. We waited around on the cold, damp station frontage, for what seemed like ages, when suddenly a figure appeared from the other side of the station - we had been waiting in the wrong place!! Ilona had seen photos of Ingo, but I hadn't, although I instantly knew who this figure was. It was a very emotional meeting, and eventually we made our way to their house for a proper introduction to Ingo, Jutta and little Marco. I was immediately put to bed, where I think I spent almost 2 days before I was well enough to participate in the proceedings. I got on really well with with Ingo, and my Wife, Christine and I have visited Bremen on many occasions since. We also went to the lovely island of Sylt, close to the Danish border with them, and I was asked to be Best man at his wedding to Ingrid, who was a friend of Jutta - complicated life, isn't it?